Central Commercial and Manual Training High School, on High Street between New and Summit Streets, was dedicated on January 31, 1912. Rabbi Solomon Foster gave the invocation, the benediction was by the Reverend William H. Morgan, and John Cotton Dana and Phillander P. Claxton, United States Commissioner of Education, were among the speakers. The dedication was held in the school's auditorium, which could seat 1,500. Central soon had nearly 1,200 students, and its first principal, William Wiener, served until 1938. In 1913 an evening school was started. The building was enlarged in 1915, and in the same year a summer school was instituted. Among the school's labs and workshops were a forge and a foundry, a sewing room, a sheet-metal room, and a wood shop. Over the years Central fielded athletic teams or clubs in soccer, baseball, track, football, basketball, golf, tennis, riflery, field hockey, and swimming, among other sports. The teams mostly competed primarily in Essex County but in the early years some games and matches were played against New York City schools, including Stuyvesant High School. 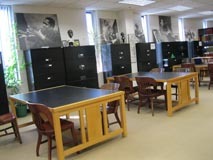 The collection is comprised of 18 binders containing newspaper clippings, correspondence, awards, photographs, game schedules, fliers, varsity letters, etc., collected by Robert A. Illig (CHS, 1950), compiler of a two-volume collection of photocopied Central High School memorabilia, "Our Lady on the Hill." These volumes, which are described in a separate entry, reproduce some of the material found in these binders. Volume 1: Daniel Ruhnke, Joseph Gamba, Frank Preston Gill, Eleanor (English) Gallagher, Pete Steffens, Ernest Kritzmacher; Volume 2: Irv Schnitzer, Isadore (Dore) Schary (by David Steinberg), Nancy Frederici, Sherman "Jocko" Maxwell, William Koczyk, Mel Bourne, and the Rev. Michael A. Fuino; Volume 3: Isadore Wasserman, Max M. Novich, Florence M. Smith, Roy Wright, Alexander Matturri, Connie Springer, Sigmund Rothschild (by Sigrid Rothschild), and Tony Farina; and Volume 4: Frank Loskot, John Kreig, Willard Burnett, Robert La Torre, Nat Bodian, and Joseph Kruger. A few individuals, including Daniel Ruhnke, Frank Gill, and Max Novich sent several letters, scattered throughout the volumes. Volume 2 also includes lists of incidents of fires and false fire alarms from 1978-1988. Volumes 11-13: "Greg Cordones, baseball and basketball (1946-1952)," "Vince Carnevale, cross-country (1934-1990)," and "Bill Helbig, football, track (1920-1992)," are dedicated to individual athletes. Volume14: "Newark Athletic Hall of Fame from Central High School" (1917-1989), consists of brief biographies and athletic career summaries of 20 CHS inductees into the Newark Athletic Hall of fame. Inductees include former students, coaches, and one championship football team. Volume17: "Central's Distinguished Alumni," consists of a list of distinguished alumni by profession, followed by clippings, photographs, etc. related to those alumni. Individuals represented in this volume include Brigadier General Kenneth Reith, Police Director Hubert Williams, Vietnam War POW Larry Guarino, orthopedic surgeon Max Novich, World War II POW Otto Schwarz, Prudential Insurance Company Executive Joseph Vecchione, Metropolitan Opera First Violinist Joseph John Malfitano, art appraiser Sigmund Rothschild, Paterson school principal Joe Clark, Mother of the Year Josephine Zuccarello Alagna, Newark Mayor Kenneth Gibson, New Jersey state senator Donal C. Fox, and others. Volume 18: "Central's Misc. History, 1912-1993," consists largely of clippings, including obituaries, from newspapers and CHS publications, regarding the school's alumni, teachers, coaches, and principals. Also included are a few photographs of alumni and several lists: of principals (1912-1989), of authors who graduated from CHS, of fire incidents, etc. Individuals mentioned in the clippings include, but are not limited to: Principal William Weiner, English teachers Alex Lewis and Jessie Boutillier, fencing coach Constantine Rotunda, Physical Education chairman Harry "Doc" Sargent, Hollywood producer Dore Schary, and Newark City Councilman Donald Bradley.